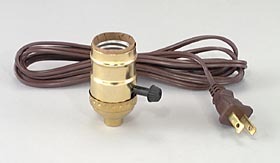 Complete 3-way Turn Knob (side outlet) Socket with 8 ft. cord, Solid Brass shell, w/ set screw. U.L. listed components. No reviews yet for the Complete Brass, 3-way Turn Knob Socket w/8 ft. cord.